Data show a slight reduction in .com growth rate, but it’s still over 8% per year. A couple weeks ago Michael Berkens wrote a story about how the base of .com and .net domain registrations was slowing “to a crawl”. A few days later Treffis issued a report stating “Verisign’s Dropping .com And .net Is A Troubling Trend”. The numbers in Berken’s post didn’t quite make sense to me. The Treffis report refers to .com and .net having a falling market share, which doesn’t seem particularly relevant with the overall namespace continuing to grow. Curious what the real story is, I decided to dig into the numbers. The most important thing I discovered is that the numbers some people compare aren’t always apples to apples. What VeriSign reports on its zone file page differ from what’s in its domain industry briefs and investor calls, which also differ from the numbers it reports to ICANN each month. For example, the numbers in the quarterly reports and domain briefs exclude domains in the 5 day add-grace period. If you compare numbers in the zone file to VeriSign’s other reports, you’ll get the wrong growth rates. Perhaps the best monthly source of information on .com registrations are the monthly reports VeriSign sends to ICANN. They’re easy to access and the archive goes back as far as you want to go. So to compare apples to apples, I pulled the end-of-quarter monthly ICANN reports going back to Q1 2009. I looked only at .com. Here’s what I found: the growth rate of the .com registration base is slowing marginally over the past few years. The chart above shows the annual growth rate in the .com base. 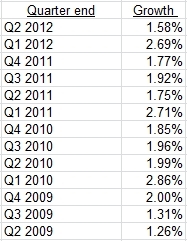 As you case see, it’s been on a slight downward projectory since Q3 of 2010. It’s never good to go down, but the drop (in growth rate, not total domains registered) has been as little as three basis points from one quarter to the next and no more than 25 basis points. It’s also coming off a nice peak following a hard period due to falling domain parking revenue. Also keep in mind that the bigger the base gets, the more domains must be added just to maintain the same growth rate. The number of net gains in 2011 exceeded 2010 despite a slower overall growth rate. 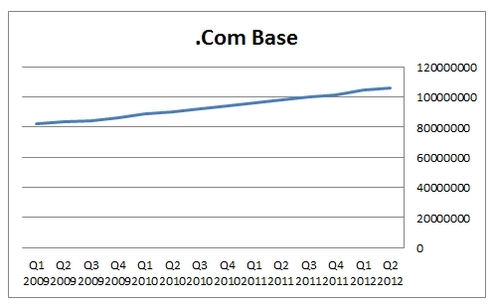 Trying to compare the growth rate in the .com base from quarter to quarter (instead of annually) is a bit challenging. Domain registrations are seasonal. Q1 is consistently a strong quarter for growth. You can still see the slight downward trend in these numbers. 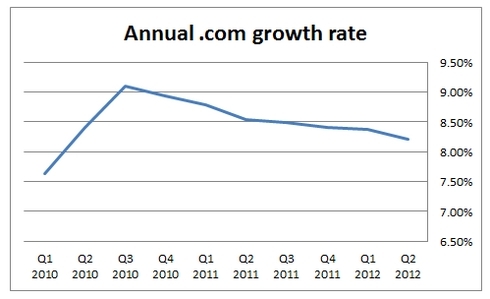 Bottom line: growth in the .com base is slowing, but ever so slightly. And it’s still growing significantly. The downside to VeriSign’s data submitted to ICANN is that it is posted three months in arrears. Some sites that track .com counts on zone information show that the reduced growth trend is continuing. Many new TLD supporters think that a proliferation of alternatives to .com will take a bite out of .com’s growth rate. They could be right in the long term. But for now, the registration base of .com continues to grow nicely. July 27, 2012Domaining, Domainnamewire, Uncategorized, VeriSign, zone fileComments Off on Behold, the .com ticker! An up-to-date number of .com registrations. As I mentioned last night, Verisign has started released daily domain counts for both the .com and .net namespaces. The information is now available at this page. The data includes both domains that are in the zone file as well as registered domains that don’t have nameservers (and thus, don’t show up in the zone file). The number of unconfigured nameserver domain names has been estimated before. It appears the current number is well below some third party estimates, although those estimates are a half year old.